Aegis Government Funding is proud to announce the closing of $6,000,000 in working capital financing for a Georgia-based company specializing in design, assembly and management of custom tool systems for military, industrial and commercial applications. 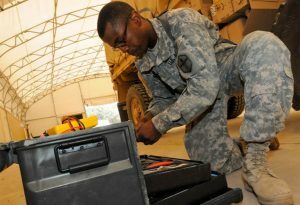 Kipper Tool Company (KTC) is a certified WOSB working with all branches of the U.S. military to meet specific requirements for outfitting and supplying soldiers, both domestic and deployed, with tools of varied trades. The company is an industry leader in providing purpose-built kits to maximize productivity and effectiveness. KTC also provides custom tool solutions for power generation, utilities, forestry, aviation, agriculture, contractors, logistics and commercial duty. As the company’s management team began to execute plans for efficiency and growth, commercial bank loan options were not adequate to support their working capital needs. The experienced team at Aegis was responsive, flexible and worked closely with KTC to structure a solution. The Aegis facility provided ample availability for KTC to take advantage of vendor discounts as well as secure resources to win larger government contracts and commercial customers. Backed by a depth of experience in financing government and commercial receivables, the Aegis Team can structure a working capital solution that offers a practical option when traditional financing is not the answer. Count on Aegis to provide expertise and sound financial guidance that will help grow your business.